Monday May 13th through Friday May 17th all bicycles will need to be removed for the week of, so our team can complete maintenance and a thorough clean out of the Bike Room. This includes spray washing of the floor and walls, beneath and around the racks, some maintenance and repairs to the racks, and painting. To accommodate this process, all bicycles will need to be removed. Bikes not removed will need to be removed by the staff, which will result in a work order charged to the corresponding Unit. The Association, Board of Directors, staff and management will not accept responsibility for the cost of any locks that need to be cut or forcibly removed. 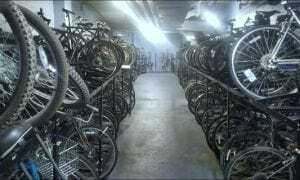 At the April 8th Board Meeting, the Board authorized a $50 work order fee for any bikes that need to physically be removed, as well as a $25 storage fee to remove the bike to an alternative location to accommodate the clean out and repair efforts. That is a total of $75. Please plan for alternative storage of your bike for these 5 days, Monday May 13th through Friday May 17th, to avoid the fee, loss of your lock and potential damage to your bike that may result from the process. If you have any questions, feel free to e-mail us at parktowercondo@draperandkramer.com or give us a call at 773-769-3250. Get regular updates and other business news, announcements and notices by joining the Park Tower Condo Association e-mail group. Just e-mail us a request to add you!